I've written about a lot of my favorite games, and even one of my favorite book series, but one thing I haven't talked about yet is TV shows. If you know me, you might already be aware, but one of my favorite shows is Twin Peaks. Twin Peaks is returning after 25 years, so I felt like this was the perfect time to look at the differences between the English and Japanese dub of the show! There aren't any spoilers, so feel free to read even if you haven't seen the show! Twin Peaks is a drama series that was originally broadcast on ABC from 1990 to 1991. It was created by David Lynch, then of The Elephant Man and Blue Velvet fame, and Mark Frost, otherwise best known for the show Hill Street Blues. The basic gist of the story is that a high school girl named Laura Palmer is murdered in the small Washington town of Twin Peaks, and FBI Special Agent Dale Cooper is assigned to investigate. That said, the main draw of the show is more the quirky characters and strange goings-on in the town of Twin Peaks, rather than just the murder investigation itself. There are quite a few characters in the show, and many of their storylines don't actually tie in to the main mystery at all. Twin Peaks was cancelled after its second season, and the show ended with an extremely shocking cliffhanger. In Japan, the show was first broadcast on premium network WOWOW starting in April of 1991. In 1992 it began to be shown on local channels like TBS as well. The show was also broadcast in a number of other countries, and was a huge hit across the globe. Incidentally, there were three official Twin Peaks tie-in books released while the show was on, and all of them came out in Japan as well! There are 30 episode of Twin Peaks total, and while I've seen them all in English plenty of times, understandably I didn't have time to watch them all in Japanese - and even if I did, there would probably be way too much to cover. Instead, for the purposes of the article I watched the first three episodes as well as the finale in Japanese. In doing so, I did find a lot of interesting differences, so let's take a look! Obviously one of the biggest differences between the original show and the Japanese dub is going to be the voices. From the episodes that I saw, most of the Japanese voice actors were fairly well-matched to their characters and delivered good performances. I was especially impressed by the actors for Sarah Palmer and Lucy - they both have very distinctive voices that the Japanese VAs imitated quite well. There were a few voice actors I found slightly less appealing as well, though. 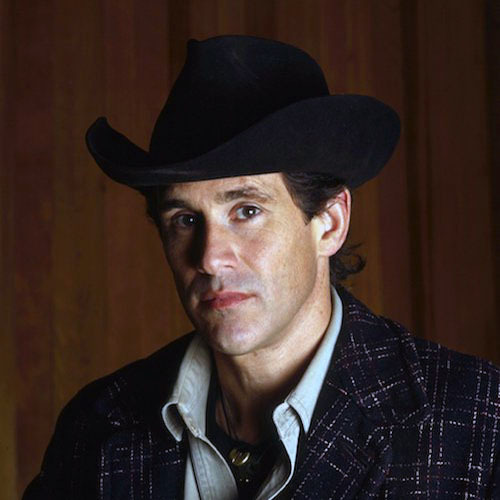 Sheriff Harry S. Truman's Japanese voice actor has a very deep, commanding voice, which in general would be a good fit for a sheriff-type character. However, Harry is actually quite soft-spoken, so the gruff voice felt a fair bit out of place. There's also some interesting things to notice in regards to what is and isn't dubbed. Sarah Palmer has quite a few scenes where she's in hysterics, and it varies from scene to scene whether or not her crying is dubbed by the Japanese VA.
From what I could tell, in scenes that transition between her talking normally and crying, the crying is dubbed, but in other scenes where it's only her briefly crying or screaming, they left the original English audio. There's also a scene where a couple of characters bark at someone like dogs; this moment also retains the original audio track rather than being dubbed. There's a character who speaks both Norwegian and English in the same scene, and in the Japanese version the audio isn't dubbed when he's speaking Norwegian, but suddenly switches to being dubbed into Japanese when he speaks English, which is quite jarring. A certain few character have their speech altered in a strange way - they were recorded as them imitating a reversed recording of their lines, and this recording is played back in reverse again. Through this process, they are still speaking comprehendible English, but it makes their voices sound quite strange and warped. I can't be 100% sure, but I don't think the Japanese dub for these characters was recorded in the same way. Rather, it just sounds like they placed an audio filter over the voice recordings to make them sound weird. Additionally, when these characters speak there are fixed subtitles in both languages. Oddly, while these subtitles match up exactly to what the actors are saying in the English version, in Japanese they're actually rather different (though basically saying the same thing) from the dubbed speech. 歪んだ声があるシーンの英語版と日本語吹き替え版 / The backwards-speech scene in both English and Japanese. It's understandable that there will be some small changes here and there when localizing an American TV drama into Japanese, but watching Twin Peaks in Japanese actually helped me notice some interesting differences in nuance between the two languages. For example, phrases like "God"/"Oh god"/"Oh my god" show up a lot in the English version, and in the Japanese dub the usually end up as some form of 「なんてこと」 (which literally means "What's happened?". The conveyed meaning in the end is the same, and really thinking about it the English version is the one that's a rather out-of-the-ordinary set phrase. Another interesting thing I noticed is that when characters call each other things like "Sweetie" or "Sweetheart", this is often replaced in the Japanese dub by the characters using each others' first names, and the opposite is often true as well. It seems that in Japanese, calling someone by their name is actually a lot more personal and intimate than it is in English! As can be expected, there are also moments now and then where the intended meaning of the original English doesn't entirely come across intact in Japanese. Bobby gets a little sarcastic here by taking the "up" literally. In the Japanese dub, his response is still "Where? ", but Mike's simply essentially saying "Something bad's happened. ", so some of the meaning is lost. Benjamin Horne: "We're gonna be able to get it for a song. One verse, no chorus." The expression "for a song" in English refers to being able to get something for very cheap, or without much effort. Ben takes the same analogy even further with his little "One verse, no chorus quip." The Japanese, unfortunately, is a much more straightforward "We should be able to get it easily, no trouble at all." Because English has things like homophones and homonyms, the intended meaning of a phrase can sometimes not be crystal clear. The above is a poem that pops up now and then in the show. It's pretty mysterious from the get-go in English, but I still noticed a couple things about the Japanese version. First off, the Japanese version of the third line is translated based on an incorrect version of the script which reads "One chance" rather than "One chants". It's pretty crazy how just by the change of "chants" to "chance", the meaning of "One" changes too! Another though I had relates to the final line. There a couple of ways to read it: "Fire, walk with me", with the line being directly addressed to fire; and "Fire walk with me", i.e. asking someone to "fire walk" with you. The first version is the likely correct interpretation, and it's the one the Japanese dub goes with. Interestingly enough, it's very easy to mishear 「火よ」 (hi yo) as 「火を」 (hi wo), and the latter would actually end up making the link similar to the second potential interpretation of the English that I mentioned above. However, looking at the words themselves, there's no ambiguity in the Japanese version - I think it's cool in general how little ambiguity there can be in written Japanese. I'll continue with just a few more stray observations from watching the show. Most units have been converted from Standard to Metric, i.e. miles to kilometers, Fahrenheit to Celsius, etc. However, the monetary unit was left as dollars, which certainly does make sense, but still stands out as slightly strange in light of all the other adjustments. The FBI comes up a lot in the show, and whenever the acronym is used the Japanese dub also simply says "FBI". However, when it's spoken out completely as "Federal Bureau of Investigation", the dub does use the Japanese name for the FBI, 「連邦捜査局」 (renpou sousa kyoku). There's a scene in the finale where a character recites a passage from the Bible. While the Japanese dub script is an accurate translation of the words, it doesn't actually match up to the Japanese translation of the Bible at all. I would hazard a guess that the translator wasn't aware of the origin of the passage being recited. Another strange thing I noticed is that while the English closed captioning pretty much matches exactly with what the characters are saying, the same isn't true for the Japanese. The subtitles convey basically the same information, but worded quite differently a good chunk of the time. I haven't watched many other things with both Japanese voices and subtitles, so I'm not sure if this is a common thing, or if it's unique to Twin Peaks. Lastly, just a tiny thing that caught my eye: there's a line where someone asks for "a cup of coffee"; for no apparent reason this is changed to "two cups of coffee" in the Japanese version. Weird, huh! A Twin Peaks feature film was released in 1992 - I checked it out in Japanese as well. The movie mostly serves as a prequel to the TV series, and features new characters as well as quite a few returning faces. Surprisingly, the movie actually came out in Japan before anywhere else, and a whole three months ahead of the US release. As you might know, usually the situation is the opposite. The English title of the movie is "Twin Peaks: Fire Walk With Me" - taken from the poem mentioned above. In Japanese, though there's a different title: 「ツイン・ピークス ローラ・パーマー最期の7日間」 ("Twin Peaks: The Last Seven Days of Laura Palmer"). That title certainly does describe what a good chunk of the movie is about, but I am curious what led to the change. It's certainly true that "Fire Walk With Me" isn't the most informative of titles, especially if you haven't even seen the show. Another factor may have been the fact that Laura Palmer was an incredibly popular character in Japan, moreso than she was even in the US, so the may have been taking advantage of that for marketing purposes. 「ツイン・ピークス ローラ・パーマー最期の7日間」のポスター / "Posters for the English and Japanese versions of the movie." There's a character named Donna Hayward, and for a few reasons she ended up being played by a different actor in the movie than she was in the TV series. Knowing that, I got curious about how they handled the Japanese dub for the character. For a moment I was quite excited, because Donna is indeed dubbed by a different person in the movie. However, some other characters' voice actors also changed during the movie, so it's possible it was simply a happy coincidence. I do assume that most movie series use the same VA for the same characters over the course of the series, but maybe that's not always the cast in Japan. I'm also curious to see who's doing the dub for the new season, and if any actors return from the original dub. Also, I mentioned that there are moments where dialogue is surprisingly not dubbed. There's a scene in the movie with the backwards-talking characters I mentioned before, but this time around it's simply not dubbed at all. Honestly I wonder if they found he voice recording/distortion process too difficult to emulate in Japanese, and so they decided to not even waste time trying. Personally, I actually think that approach isn't the worst idea ever. Twin Peaks had a huge impact on both US culture in general, and US television specifically. There are dozens of shows which site Twin Peaks as an inspiration, and the show brought about an evolution in the type of content created for and broadcast on television. The show was so popular during its time, that water-cooler discussions of the most recent episode became a common thing at many companies. 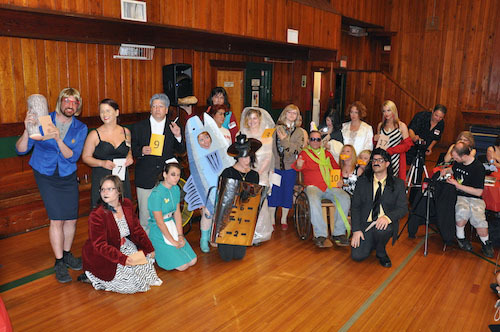 There's even a yearly gathering for Twin Peaks fans: the Twin Peaks Festival! Twin Peaks Festival はこんな感じらしいです / A photograph from the 2012 Twin Peaks Fest. While the show doesn't seem to have had a huge long-term impact on Japanese culture, it was hugely popular when it originally aired, the fanbase second only to that of the US. Apparently over 30% of WOWOW subscribers at the time had subscribed solely to be able to see Twin Peaks. 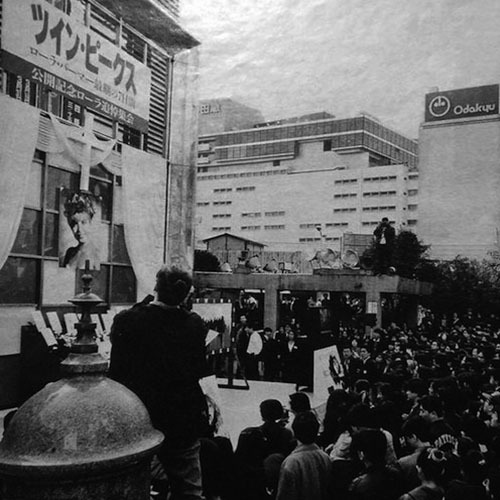 Fans in Japan became known as "Peakers", and would travel in droves to the original filming locations in the US. 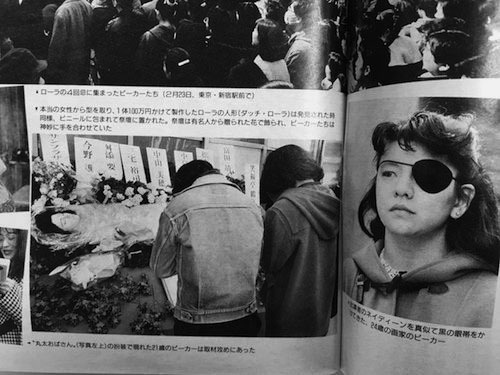 There were even "official memorials" for Laura Palmer held in public in Japan to commemorate the release of the film! 当時の日本はこんな感じだったそうです / The Japanese fanbase was pretty dedicated back in the day. 公開記念ローラ追悼集会 / One of the "official memorials" for Laura Palmer held in Japan. In a bizarre collaboration, there was even a series of Twin Peaks-themed commercials for Georgia Coffee! 見てみてください / Give it a watch! This track from my good friend Burning was inspired by and features sampling from the Twin Peaks movie. It's included on the Hollywood movie remix CD released last year on Allkore! 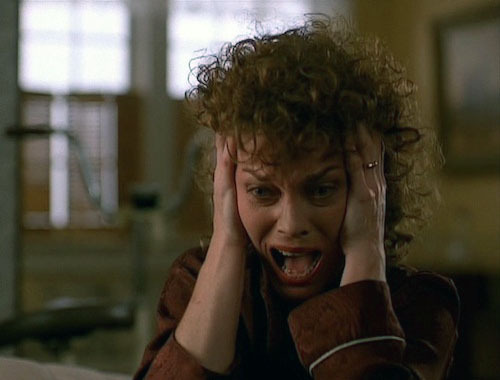 Twin Peaks is happening again on Showtime. Please consider watching it. I'll see you again in one month.